Fort Revenge. Just the name conjures up boyhood images of the sound and fury of battle, with cannons booming, muskets firing, military flags waving, the clash of swords, and the sound of battle cries. Fort Revenge still stands on the island of Ai (called Poule Way on this map), one of the remote Banda islands in Eastern Indonesia, but how did it get its name? 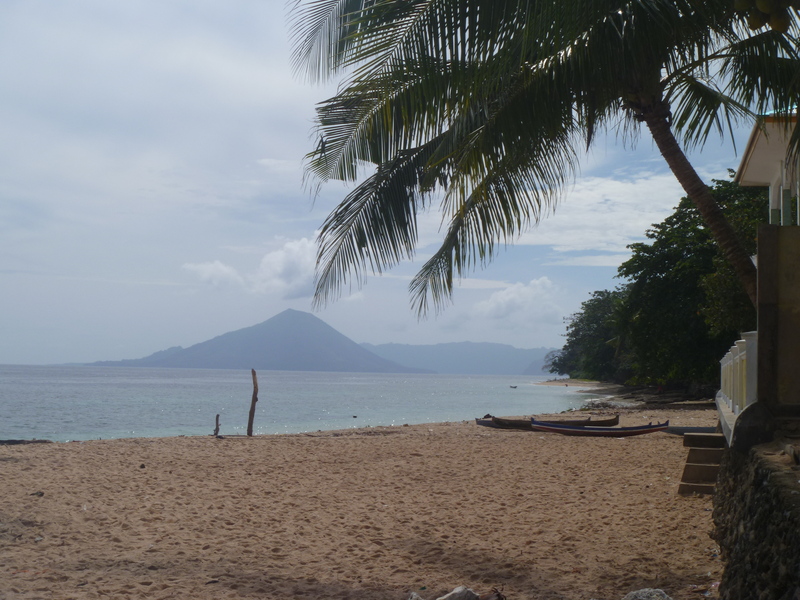 When the English East India Company vessel Expedition arrived in the Banda Islands in 1609, Captain David Middleton found Admiral Verhoef and his Dutch East India Company (VOC) war fleet had occupied the main islands and were busy building their garrison on Banda Neira. The only place he could trade for nutmeg were the outer islands of Ai and Run whose headmen had steadfastly refused to sign any agreement with the Dutch. These outer islands were claimed by the English in 1616 when the inhabitants of Run signed an agreement accepting James I of England as sovereign of the island. 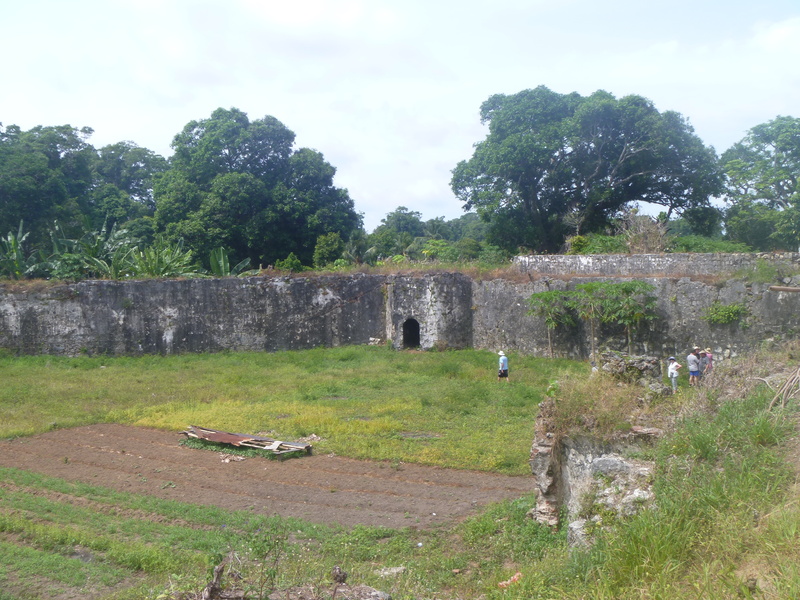 The English and their local allies built a fort on Ai, which was the first line of defense against a possible Dutch attack from nearby Banda which is only 10 kilometres away. This came in 1615, when 900 Dutch soldiers and their mercenaries landed on the island and after a day of fighting captured the fort. However that night the English and their island allies’ counter attacked, killing 200 Dutch soldiers as they slept and forcing the others to flee the island as best they could. The English placed gun batteries on the highest part of Ai in preparation for the Dutch counter-attack, which came a year later. The gun batteries had the range to damage the Dutch ships before they could force a landing, but when their ammunition ran out the fort was overun and the remaining Englishmen forced to retreat to their base on the adjacent island of Run. For obvious reasons the fort on Ai was renamed Fort Revenge and stands as a symbol of the Dutch conquest of these outer islands. A long entrance tunnel allows you to walk through the broad walls of the fort and enter the interior courtyard, which is now used as a vegetable garden. 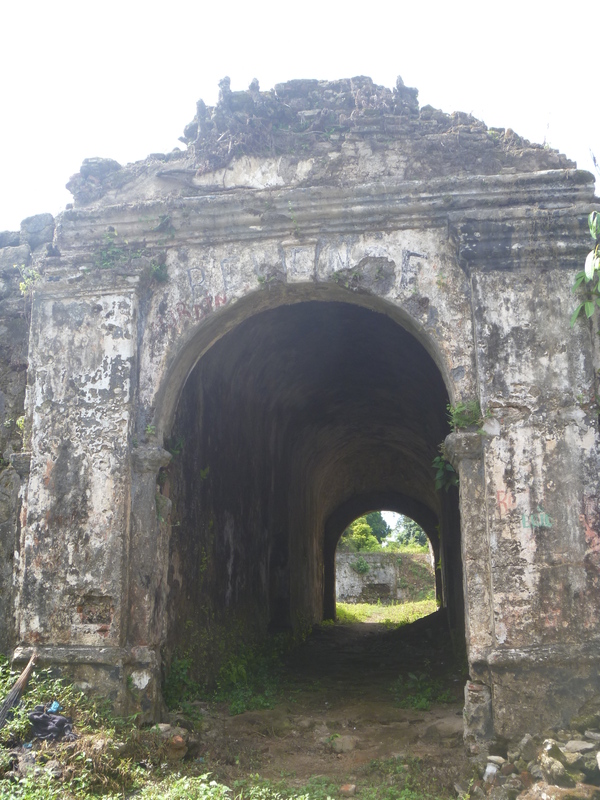 The interior buildings of the fort have long since disappeared but evidence of the forts purpose and survival still exist, that is the dungeons, the gunpowder magazine and the water well. On the far wall is a Dutch plaque which must have some historic significance and I hope someone can identify the coat of arms. Does anyone recognize the Coat of Arms on this plaque? 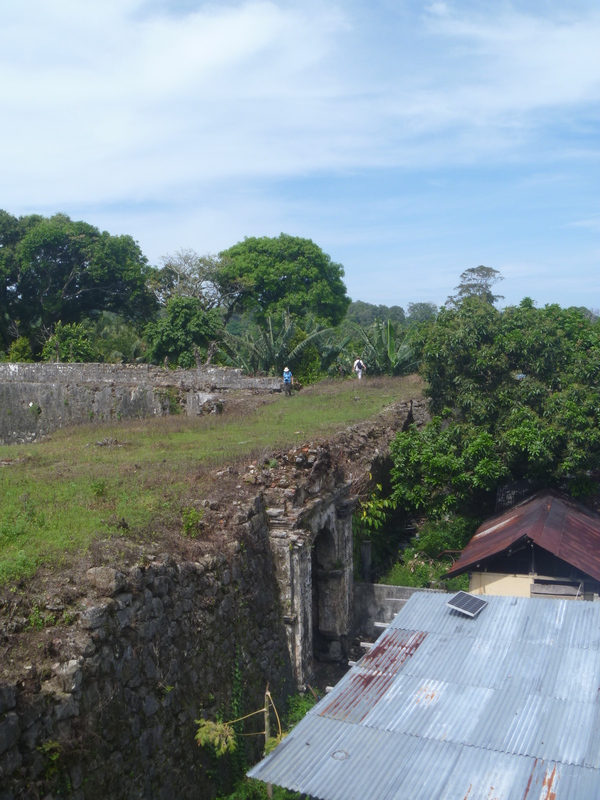 Stone steps lead up to one of the bastions, overlooking the Banda Sea and the adjacent village, where an ancient cannon no longer needed to defend the fort lies on the ground. From this bastion you can see the shape of the fort which is a five sided pentagon with a diamond shaped bastion at each corner. 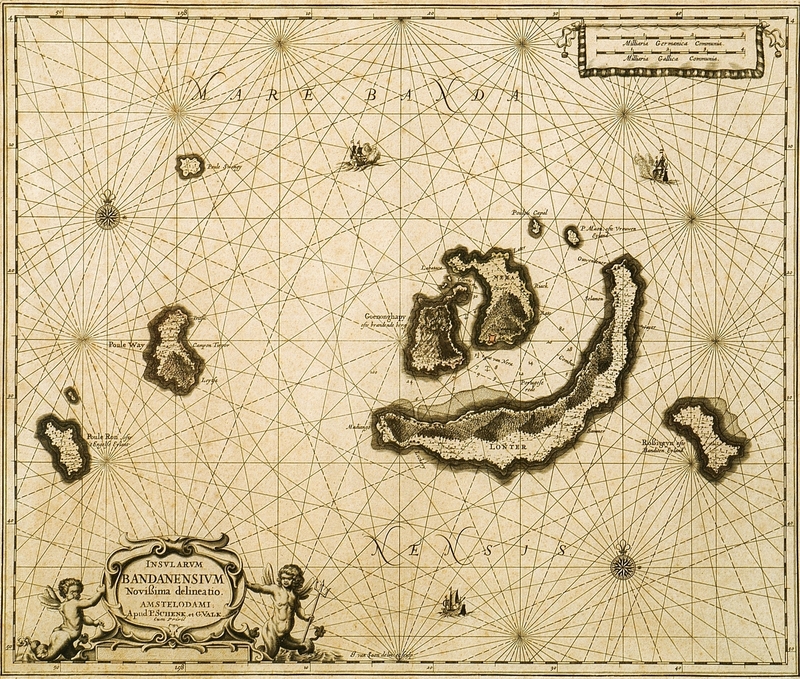 This entry was posted in Uncategorized and tagged Ai, banda, dutch east india company, english east india company, fort revenge, ian burnet, maluku, moluccas, ombak putih, run, sea trek, spice islands, VOC. Bookmark the permalink. Thanks for sharing your research and boarding our knowledge of the area.Look forward to more . Great article, Ian! Is this the name of your upcoming book? Charles. Thanks for that riveting story. If a drawing would be available that brings out the picture on that coat of arms, i.e. only of the part within the ‘shield’, I would have a go in trying to identify/find it. As it is I do not recognise the image from the photo, apart from it being in four quarters?, possibly with an image in each quarter. PS As the book is called ”East Indies” I undertand for the note above…, I would also translate VOC to United East Indies Company, rather than refer to the east of India, which is not part of the V…O…-…C… in full. Thanks Peter, There is no drawing that I have seen but I will send you the original photo and perhaps you can enhance it in some way. Even sweeter revenge was when the British swapped Run for Manhattan! History should record and acclaim whoever it was that engineered that manoeuvre. Someone among the English negotiating the Treaty of Breda in 1667 decided to forego England’s claim to Run and retain their hold on Manhattan instead. Was he farsighted or accidentally lucky? The Dutch obviously thought they had the better deal by reinforcing their monopoly of the nutmeg trade with Run. I bet the fortuitous English decision was made unencumbered by any ‘cost-benefit analysis’ or similar?? I’m just reading Nathaniel’s Nutmeg by Giles Milton. 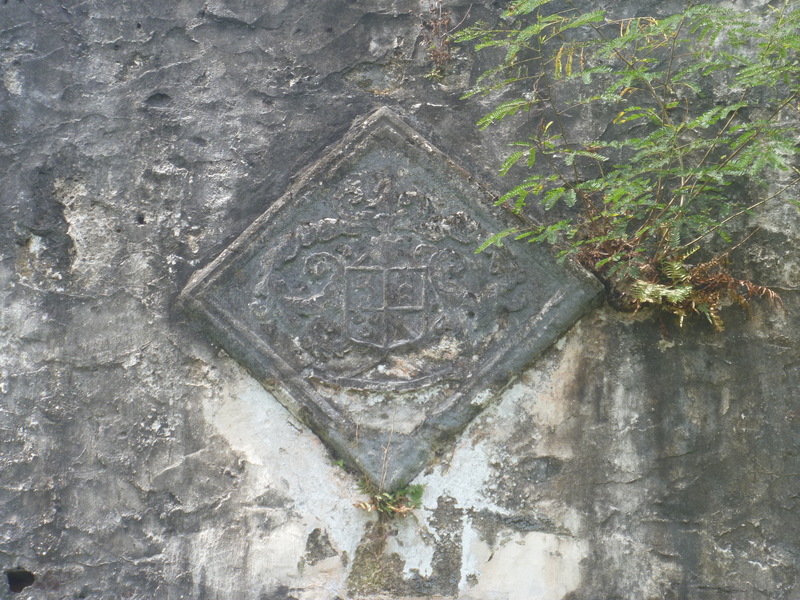 It seems the fort was built by the Dutch admiral Lam which may be a clue. I spent an hour or so alone in that fort. It was indescribably creepy, even though I saw nothing particularly spooky.